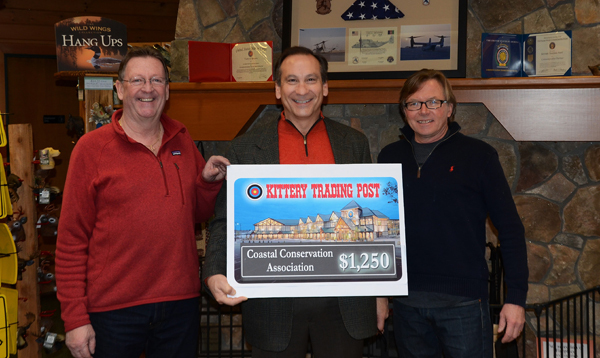 Kittery Trading Post, a family-owned full line outdoor retailer in Kittery, Maine, recently presented a check for $1,250 to CCA-Maine in recognition of CCA’s contribution to marine resource conservation in Maine. The conservation-minded retailer actively promotes a “round-up” program which encourages customers to round off their transaction totals to the next highest dollar amount. All monies raised through the program are distributed quarterly to non-profits and industry partners that share Kittery Trading Post’s mission of habitat preservation and natural resource conservation. Jeff Verrill, Vice-President of CCA-Maine, received the check from John Peterson (at left), Events Coordinator for Kittery Trading Post, and Jon Morrill, Vice-President, Events & Promotion for the retailer.